On a chilly fall day I love to make soup and bake. Nothing warms you like yummy smells coming from the kitchen. 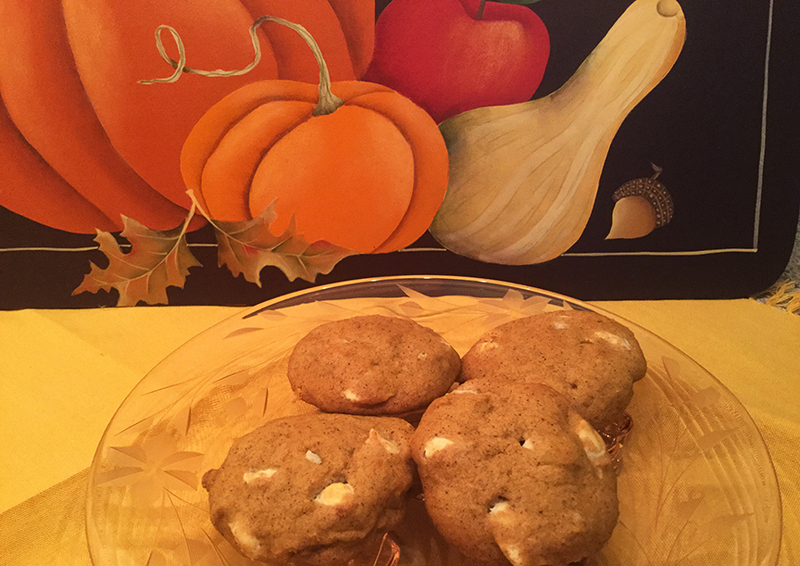 One of my favorite fall cookies are Macadamia and White Chocolate Cookies. They are a delicious combination of pumpkin, spices, crunchy nuts, and sweet bits of white chocolate. Because a can of pumpkin is now 1 3/4 cups, I usually make a batch and a half at a time. I toast the macadamia nuts on a cookie sheet in a 3250F oven for 5 to 10 minutes, watching them closely and stirring occasionally. 2/3 Cup toasted macadamia nuts, coarsely chopped. In small bowl, combine flour, baking soda, cinnamon, and cardamom; set aside. In large mixer bowl, cream butter and sugars. Add pumpkin, egg, and vanilla; beat until light and creamy. Add dry ingredients; mix well. Stir in vanilla chips and nuts. Drop by rounded tablespoon onto greased cookie sheets. Flatten slightly with back of spoon. Bake in preheated 3500F oven for 15 to 20 minutes, or until lightly browned. Cool slightly; remove from cookie sheet. Cool on wire racks. Makes 3 dozen cookies. I think you and your family will enjoy these, they are a favorite of ours. The picture in the background is a tray insert that I painted with Shara Reiner….Love her whimsical designs….and her!